Sam Brownback, who serves as the ambassador at large for religious freedom at the State Department, pledged a new U.S. government commitment to halting the persecution of religious minorities around the world and called on other countries to join the campaign. Delegations from roughly 80 countries joined Brownback at the State Department Tuesday for the first U.S. government summit on religious freedom, a human-rights priority that Secretary of State Mike Pompeo vowed to highlight during his tenure. "Religious freedom really, truly is for everyone. It's a right given by God, and your presence is an encouragement to people of faith around the world that someone cares about their plight," Brownback told the gathering. "Unfortunately, a large majority of the world live in countries where the freedom to practice their own faith is extremely limited … and in some cases deadly," said Brownback. Out of respect for the security of the delegations involved, the State Department as of Tuesday morning did not provide a public list of the countries represented at the summit. 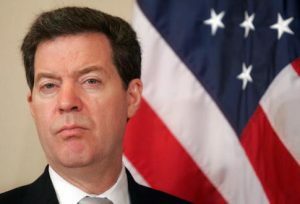 Religious minorities are killed, persecuted, and harassed in too many countries, Brownback said, specifically citing the Holocaust and continued attacks on Jews, as well as the persecution of Christians in the Middle East and China, the Rohingya Muslims in Burma, and the Uighur Muslim minority in China. In Turkey, he said, Christian Pastor Andrew Brunson remains imprisoned under false charges. "This cannot be allowed to continue," he said. "The lack of religious freedom anywhere is a threat to peace and prosperity everywhere." "This is a noble cause but it's also a very practical one—where religious freedom is promoted, economic opportunity grows," he said. A more private launch of the summit began at the Holocaust Museum in Washington, D.C., Monday where victims of religious persecution abroad came together for a tour. Brownback recalled that after the tour, one of the participants remarked on how "unimaginative evil is," arguing that the same types of terrible atrocities against religious minorities have taken place time and time again throughout history. "And yet our task is to stop that from taking place," he said. Two speakers then shared their experiences with religious persecution at the hand of the Chinese government: the wife of a Christian pastor who built elementary schools in China and has been imprisoned by the Chinese government for the last year on false human-trafficking charges, and a Uighur man who recently fled with his family from a detention camp in China, where he was severely beaten and injured. Emmy-award winning reality television producer Mark Burnett, who referred to himself and his wife as the "noisiest Christians in Hollywood," participated in a panel with former Fox News anchor Greta Van Susteren in which he called for a better messaging and marketing plan on religious-freedom issues. Burnett and his wife, actress Roma Downey, have spoken out repeatedly on the issue of Christian and Yazidi genocide at the hands of the Islamic State in Iraq and Syria. In the fall of 2014, the couple partnered with Jordan's King Abdullah to launch a $24 million campaign, whose title played off the Game of Thrones theme "Winter is Coming" to help Christians and Yazidis displaced by ISIS to survive the coming winter. "We are not just about being Christians, it's about being friends with Muslims and Jews and Buddhists – this is about tolerance. This ministerial is so important," he said Tuesday at the summit. "I'm sure some people are thinking I'm just some Hollywood guy that's flown in – why does he have anything to do with it? Every little thing that gets done makes other people pay attention. This madness cannot carry on – it's destroying the world and you all are the hope. Thank you so much," he said. Burnett said he wouldn't stop speaking out about the cause of religious freedom. "I'm here, and I've got a big mouth and I speak up," he said. A panel discussion afterward discussed private grants for nonprofits dedicated to religious freedom causes around the globe and the grant-making process. Tuesday's afternoon agenda includes several other personal accounts of religious persecution, as well as an address by Office of Management and Budget Director Mick Mulvaney. Civil society groups and other nonprofits participating in the summit include: the Religious Freedom Institute, the 21st Century Wilberforce Initiative, the International Christian Concern, Law and Liberty Trust, the Jubilee Campaign, Victims of Communism Memorial Foundation, and the Faith Coalition to Stop Genocide in Burma.